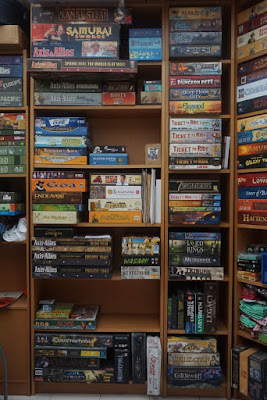 The last time I made a photo record of my boardgame collection was not that long ago - October 2014. I'm doing it again because I just made a major rearrangement of my games. I switched from vertical storage to horizontal storage. I did this after reading an article on Spielbox magazine. According to a museum curator grade boardgame collector, the best way to store boardgames is horizontal. I have been doing vertical all these years. 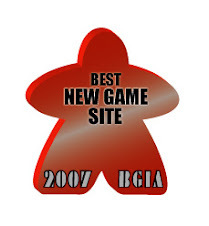 If I remember correctly I got the idea of vertical being better from BGG. Vertical storage means you won't have boxes stacked atop one another and the upper boxes damaging the lower ones due to their weight. Also it is easier to take a box off the shelf. However one problem I always have with the vertical system is for some games the components fall all over the place inside the box and they get quite messy. Most boardgames have some form of box insert, and these box inserts are usually designed for vertical use. When you store a boardgame vertically, components may fall out of their designated slots. 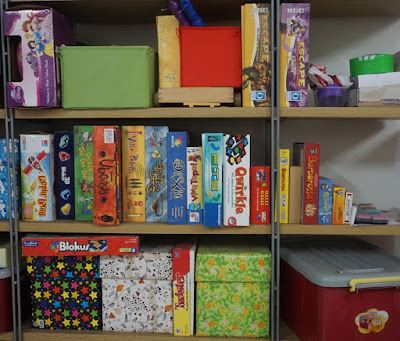 The Spielbox article says that vertical storage is better as long as you only stack boxes of similar dimensions, and you don't stack too many. I have decided to trust the professional and ignore the hobbyists. I did a major rearrangement, and while I was at it I also did some cleaning. Many boxes had gathered some dust and I wiped them clean using a slightly damp cloth. 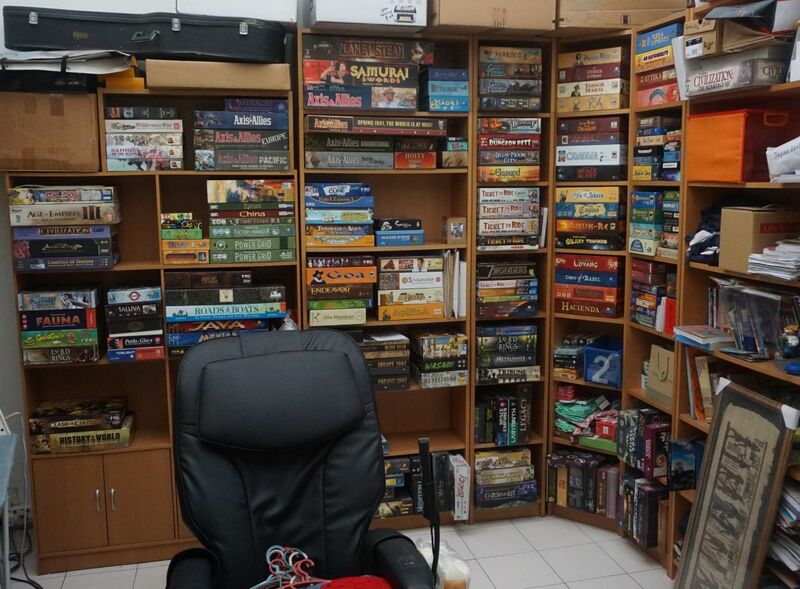 Since the last photo record, I had not gained many new boardgames (by boardgame hobbyist standards, mind you). Maybe just a dozen or so. Here's my main storage area. Most games are now horizontal. From this photo it may seem like I still have much room for growth, but this is misleading. 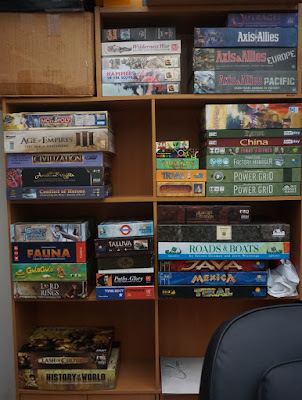 I have brought some games to my office, so this photo record is not 100% complete. This photo was taken in Oct 2014. The games were mostly vertical then. Zooming in to the leftmost columns of my main storage area. Recently acquired games include Ships, Pandemic: The Cure and Machi Koro Deluxe. Some of the games at the bottom are still vertical, because these are Han's and Allen's games. I didn't remember whether they prefer their games vertical or horizontal, so I didn't touch them. 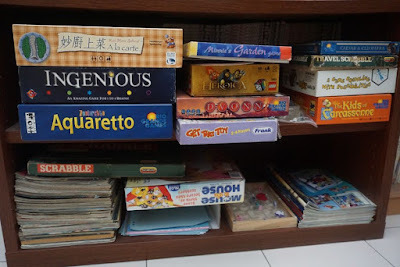 This is the first offshoot section, where I keep some children's games and games which children can play too. 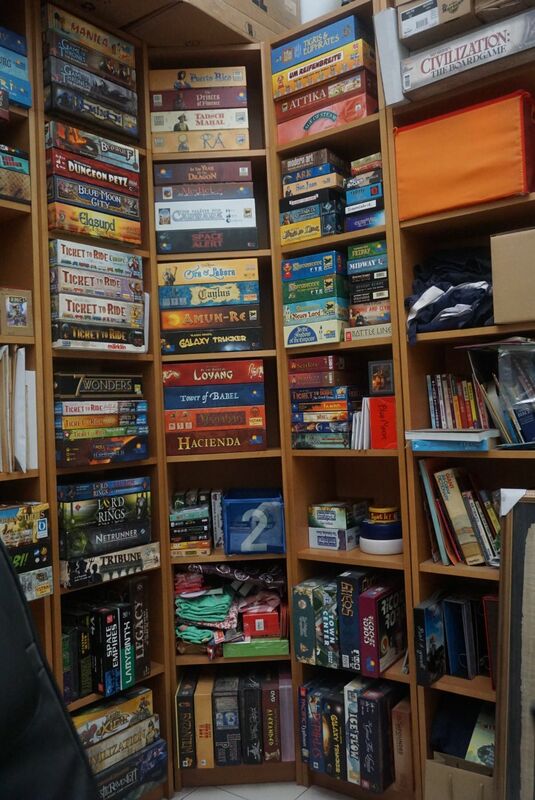 That stack of magazines at the bottom right are Spielbox magazines. Log from Meeples Cafe still keep free copies for me. 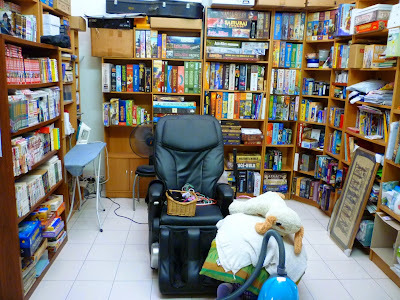 This is the second offshoot section, downstairs. These are also children's games or games which children can play. The other boxes contain my children's toys. Only when I took this photo did I realise that I had forgotten to rearrange the boxes here. I did it afterwards, but I have no photo to prove it.